@kafluke It happens to me too. Also on the latest dev-branch, Advance Menu has stopped working. @Sebastian-Roth @Wayne-Workman Thank you for reminding me about another DHCP server. I double checked with our network admin and we found the old IP in DHCP server. 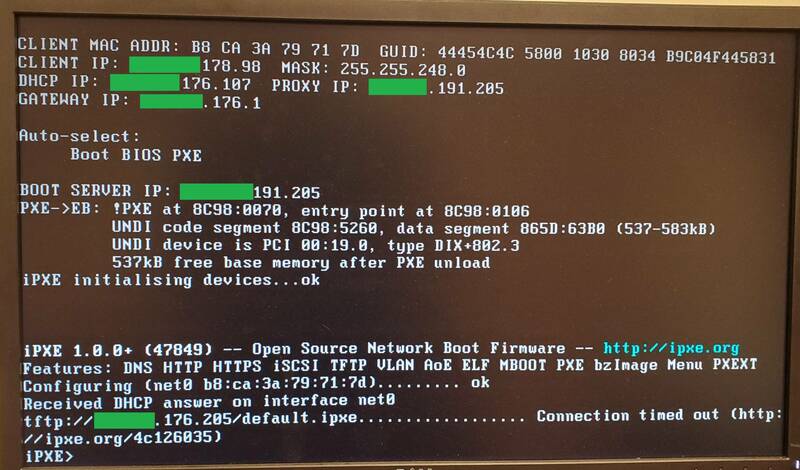 We did some tests before but couldn’t get pxe to work so we opted for dnsmasq option and left the IP there. We have to migrate our servers to a different building so we need to change our FOG IP. I follow instructions to change the server IP and IP in FOG website as instructed in here: https://forums.fogproject.org/topic/10841/problems-after-changing-fog-server-ip/2. I even ran updateIP tool and reran the installation several times. Client boots up fine but when it gets the palce to download default.ipxe file through tftp, it is still looking for the OLD server IP. FOG is running on Debian 8.11 with DNSMASQ 2.76. I checked dnsmasq configuration file and it does have the new IP and it’s not providing tftp service. I’m using tftpd-hpa for TFTP service . config.class.php does have the new IP as well. What am I missing here? Thanks in advance for your helps or suggestions. @Sebastian-Roth Thanks a million. You’ve nailed it. I’ve tested it and it is the case with Sierra. I saw that Debian released a stable version of DNSMASQ 2.76-5 for Stretch. Has anyone tried this version on Jessie? I want to use UEFI but worry about its comparability on Jessie. In general, is it okay to use packages designed for Stretch on Jessie? @Tom-Elliott Does he needs to add /storage1 to /etc/exports?